His campaign against Henry Clay would be subject to endless jokes, but Democratic candidate James K. Polk, whose running mate was Philadelphia born George M. Dallas, would survive the unfortunate similarity of his name to that of the dance to become the 11th President of the United States. As for the Polka, its rise from obscurity to universal fame had began only a few short years before. The Polka originated somewhere in rural eastern Europe and appeared in salons in Prague and Vienna by the late 1830s. 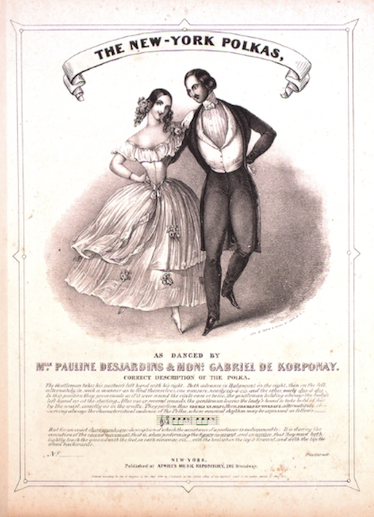 By the time it exploded upon the ballroom dance world of Paris in the early 1840s, its origin had been lost in myth; those who can profit by a new fad always like to claim a role in its success. 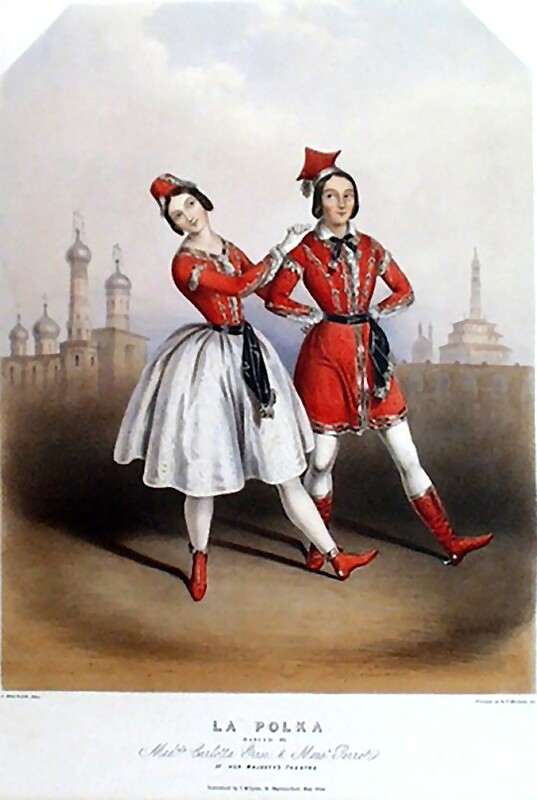 Overnight, all of Paris was in the thrall of what was commonly called “Polkamania.” As the public clamored for lessons to learn the new dance, well-known teachers like Henri Cellarius, featured left, on the cover of an 1848 Polka published in Philadelphia, and his rival Jean Coralli of the Paris Opera Ballet nearly came to blows in a public showdown, each claiming to be teaching the “authentic” version of the Polka. The dance’s popularity was helped in no small measure by the fact that in an effort to take advantage of the demand for lessons, these and many other Parisian dance teachers had hired attractive ballet-girls as teachers. This filled their dancing salons with hormonal young men as eager to embrace their lovely teachers as to learn the proper mechanics of the dance. 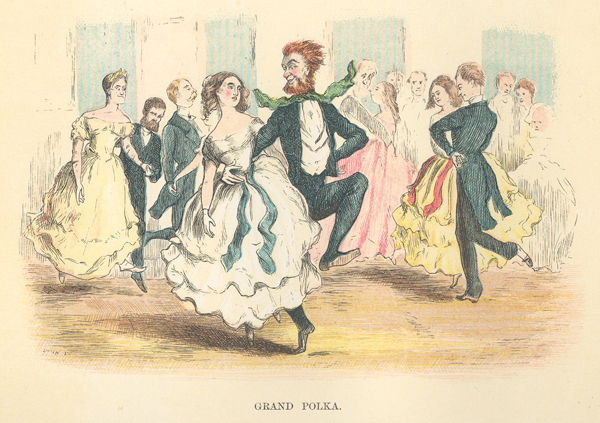 The fact was that the small, graceful hops of the Polka could easily turn into a rollicking, raucous romp – fun, yes, but unacceptable in the polite ballroom, see illustration below. It presented the tempting possibility to deviate from the physical control and decorum that was the hallmark of Victorian gentility. In only a few months, this controversial new dance would reach Philadelphia. Mallet was hinting that perhaps Madame Hazard’s version was the crass theatrical variety, while hers was “graceful” and suitable for the genteel young ladies who were her pupils. The last entrant in Philadelphia’s “Polka Wars” was an exiled Hungarian army officer dashingly named Gabriel de Korponay, left, who arrived in December at middle of the season. A dancer and teacher, he conducted classes here in English, German and French and claimed to have introduced the Polka to America. His wife played piano, composed and gave music lessons. Korponay would settle in Philadelphia and later served as a captain in the Mexican War and as a colonel in the 28th Pennsylvania Volunteer Infantry during the Civil War. These extravagant claims and the one-upmanship continued to appear in the advertisements of the North American throughout the rest of the 1844-45 social season. However, the fact is that by 1844, the “authenticity” of any Polka style being taught was really a moot point. 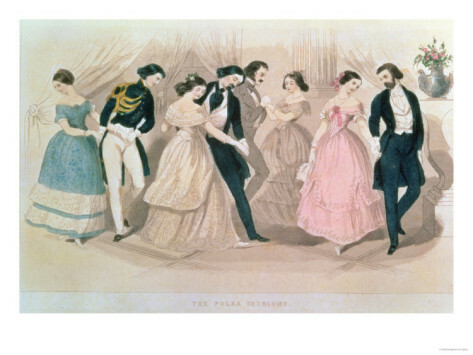 The dance, like most of the fashionable dances of the nineteenth century, had been entirely re-made in Parisian ballrooms to suit polite tastes and had lost most of the rough edges of its peasant origin. This same phenomenon would appear again in 1913 when the Tango was introduced to America from Argentina after being sanitized by Parisian dance masters. The Polka was the topic of conversation on everyone’s lips, “Have you seen it?” “Can you do it?” Philadelphia stores sold Polka hats, Polka jackets, Polka boots and the only Polka fashion that has endured to this day – fabrics covered with Polka dots. For a worry or a gloom. And a lot of sweet romancing. When they play the polka. ● The Polka quote from Swedish writer and feminist Frederika Bremer is taken from the 1844 New Monthly Magazine and Humorist. 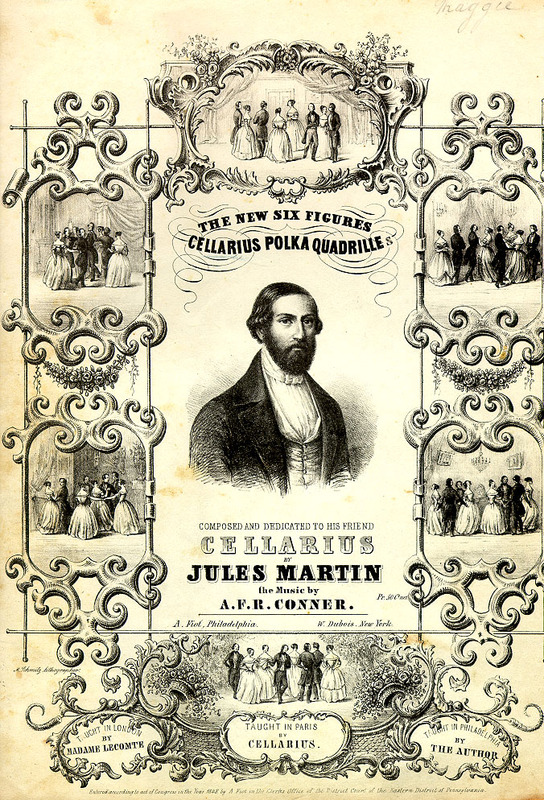 ● The 1848 Cellarius Polka Quadrilles were truly a local production. 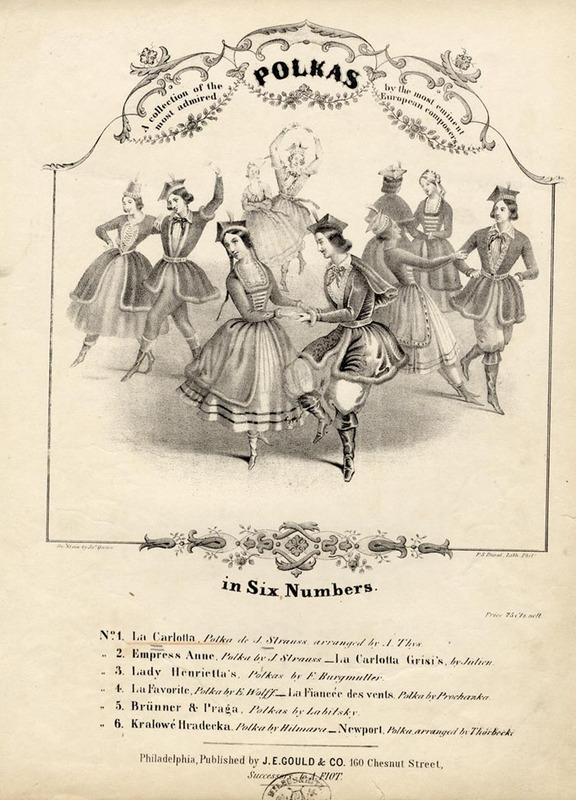 The sheet music was printed by the Philadelphia publisher A. Fiot, the dance sequence was choreographed by Philadelphia dance master Jules Martin and set to music composed by Philadelphia African-American musician A. F. R. Conner.